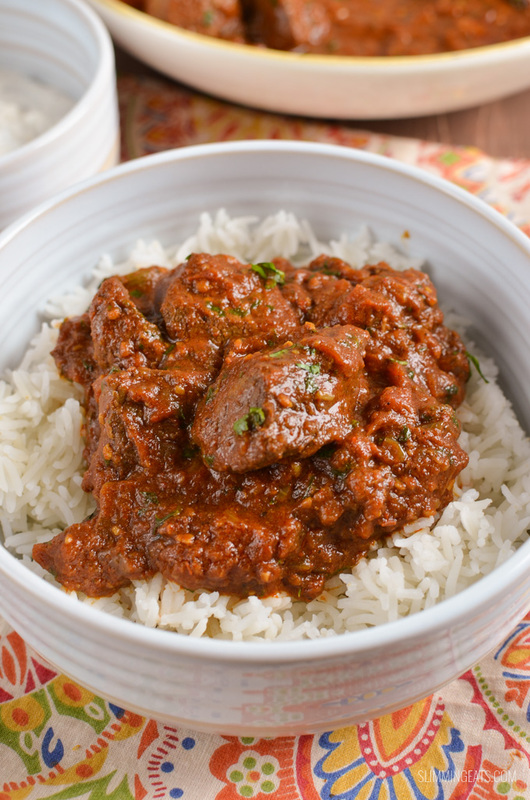 I love Indian food, it is one of my favourite cuisines and I was introduced to the food from a very young age (my father worked in ventilation for the restaurant businesses). 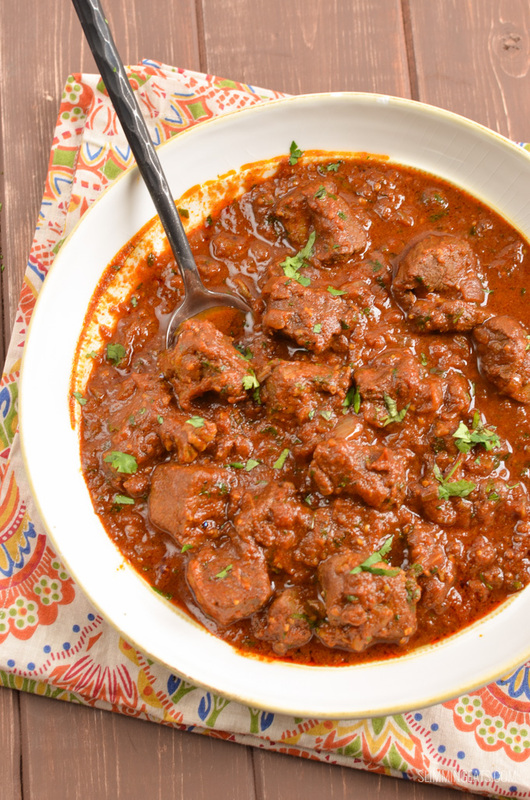 The very first Indian dish I had was Chicken tandoori and I loved it, of course I have tried a huge variety of dishes now and have loved them all. I am also picking up lots of tips on traditional ways of cooking from a good friend I have met here in Canada. 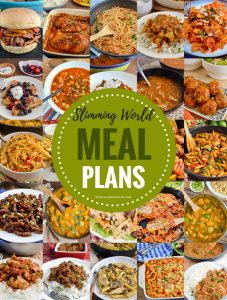 One of the things I discovered when I moved to Canada, especially in the suburban area I live in, is that there are not very many choices of places to eat my favourite cuisine, so I have had to resort to creating them myself. I own several good cookbooks, my favorite being this one – The India Cook Book by Pushpesh Pant. However Indian cooking tends to use a lot of ghee (a rich flavorsome clarified butter) when creating these dishes and ghee is something that is not very syn friendly. 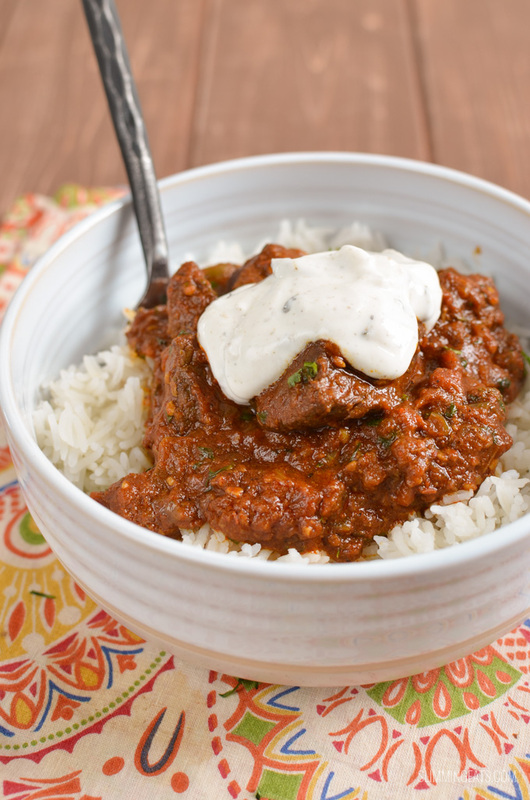 We can use it, but only in small amounts if we want to keep the syns low, so I have had to adapt lots of my favorites, and add my own little tips and tricks I have picked up along the way when I create my favorite Indian dishes. 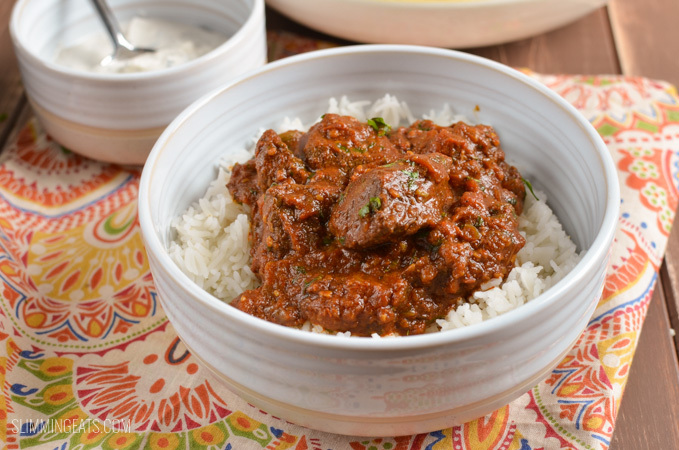 I really hope you enjoy my take on Lamb Rogan Josh. 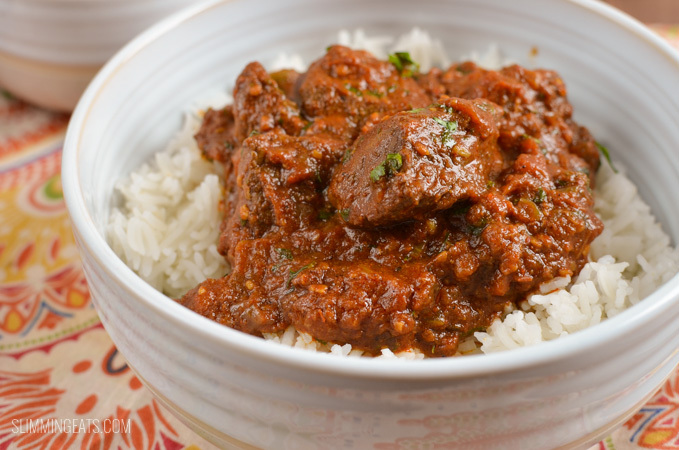 I use lamb here as I find it is the best meat in a curry, it remains lovely and tender and really packs flavour to the dish, but you are free to substitute with chicken, shrimps or any of protein of your choice. If you want to keep this syn free, then substitute the ghee with spray oil, however I think most curries need a starting base of ghee, onion, garlic and ginger to get that lovely flavour. I like to top the majority of curries with a dollop of homemade mint yogurt – fat free plain yogurt, fresh chopped mint, juice of a lemon and then if I have some this awesome MDH Chutney Podina Masala (it gives a really authentic taste to the yogurt). I make up my mint yogurt mix first and then add a little bit at a time, until it tastes as I like. Add the ghee to a deep lidded frying pan over a medium high heat. Add the onion and fry till golden and translucent. Add the turmeric, garlic and ginger and fry for a further few mins. Add in the lamb and all other spices and continue to fry for a couple of minutes until the lamb is coated in all the spices. Add the fresh chopped tomatoes, including the juices and the tomato paste, reduce heat , cover with a lid and simmer for approx 30 mins, until lamb is tender and tomatoes have broken down to a smooth sauce. If it gets too dry just add a little water at a time. Season as needed with salt and black pepper and serve topped with freshly chopped coriander. Add the fresh chopped tomatoes, including the juices and the tomato paste, water,. Add lid, close vent and set for manual pressure cook for 30 mins. Looking forward to this all week. Took Lamb out of freezer yesterday to let it defrost slowly. Gathered all my ingredients together only to find I had taken out of freezer Sirloin steaks. Too good to put in curry. So now it’s got in braising Beef . Wonder how that will tune out? Bit confused about this, it says it serves 2 and is 9 WW SP. However, 400g of lamb shoulder is 31sp alone! Not sure the recipe is accurate? This was really delicious, thank you. Am going to have to batch cook a load. 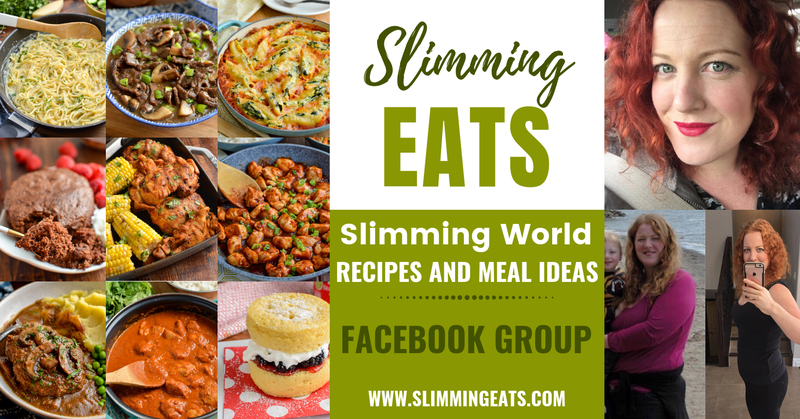 I tried this dish for the first time today, I was a little sceptical as a lot of the SlimmingWorld curries end up being quite wet and lacking in something, however, this was delicious. I will definitely be making it again. Thank you. Hi Bee, so glad you enjoyed it. Thanks for coming back and commenting.